From the earliest times, human communities have not remained static in their native countries but have travelled throughout the world in search of commerce, expansion through conquest or escape from hunger and oppression. This has resulted in the ‘diffusion of cultures’ in which people of different cultures have met and influenced one another. It is true of religious communities as well as of secular ones and this has influenced the progressive growth of the great religions and development of new ones at various periods of history through interfaith dialogue. Britain has experienced this phenomenon during the last three millennia or more with continual waves of immigration: Stone Age people, Celts, Romans, Anglo-Saxons, Vikings, Normans, Huguenots, Jews etc. It has made our country what it is, as any person with a sense of history will recognise. In the last hundred years, the process has accelerated and Britain is now host to a multitude of faith communities, many from the East, the Middle East and Europe, as well as from the Caribbean and Africa. 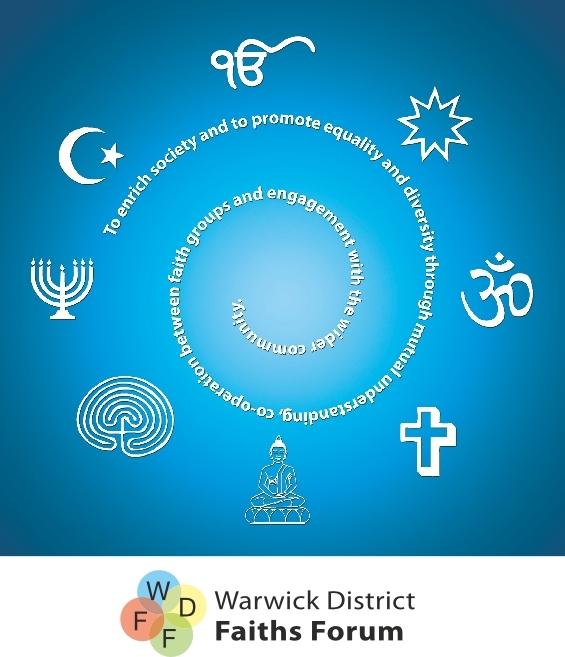 These pages are representatives of major faiths in Warwick District present an introduction to their beliefs and history. This has been done in a spirit, not of triumphalism, confrontation or of syncretism, but rather in a spirit of serious presentation of an interfaith awareness from which all may benefit. Moreover, we have endeavoured to show that authentic religion is free of the fundamentalism and bigotry that is the mark of so many who use (or rather misuse) their interpretation of their own religion and that of others as a justification for terrorism and prejudice against those of other faiths. Interfaith dialogue takes two forms: On the one hand we build upon the recognition of what we all have in common; on the other hand we learn what we each have that is unique and that can give new insights to each other. One result of the latter is that when we discover insights in other faiths, it can stimulate us to examine our own more closely to uncover what is hidden within our own traditions. The task we have faced is twofold: firstly to help newcomers to integrate into our culture, and secondly to understand how the latter may contribute to our national development through the insights that their faiths and culture bring to it. The contributors have had to condense the information on our faiths to the limited space available. Inevitably much that is important has been omitted, but it is hoped that what has been written will give the reader an introduction to the wide spiritual experience of Humanity and stimulate their interest to find out more about the faiths that people around us believe in.